Re: I Don't Want Just More Twitter Followers. I Want MORE SALES! A lot of folks will try to sell you on getting more followers with Twitter. More followers, they say, equals a bigger list. See, I have a different approach. I don't care about the number of followers I have. I care about the targeted traffic I receive from Twitter. Targeted traffic = sales, and I have the stats to prove it. Put another way: A few hundred followers who are passionate about my niche are light years better than hundreds of thousands who could care less. I could probably get thousands of Britney Spears' followers to follow me, but what will that get me? Do you think they're going to want to network with me or visit my blog or buy my products and services? This is a case where quality definitely trumps quantity. And where you choose to focus your efforts makes all the difference. Why Twitter? Well, it just happens to be a very effective way of generated pre-qualified free website traffic. If you do it correctly. For a long time, I hovered around the same number of followers. That's because I didn't do anything to change that. "Listen Carefully To Everything He Says About Marketing!" "But he's more than a writer. Listen carefully to everything he says about marketing! John's an 'insider' with some of the top names in the business, and his bag of tricks gets deeper by the day!" "As a direct response marketer and copywriter, John gets it. "He knows that great copywriting chops are only half the battle. "The top copywriters also practice world-class marketing strategies, and John's 'in the trenches' experience puts him in the big leagues. "It's no wonder John has his pick of the best and brightest marketers in the world to work with." "I DREAM about having John Ritskowitz write every word of sales copy that markets everything I do. "I CRAVE claiming every second of his priceless time and every brilliant thought from his elegant marketing mind. I REJOICE in knowing that John is impacting millions with his heart, compassion and professional mastery." Best-Selling Author of "Impact: How to Get Noticed, Motivate Millions and Make a Difference in a Noisy World"
But right around the 2nd week of April I started experimenting and using these techniques (that I want to show you), and boy did they deliver! Some of them I figured out on my own—that nobody else is talking about—and some I learned from others. But the end result is pretty clear. Now I don't claim to be a social media expert or Twitter guru. Mostly I just applied some tried and true direct response techniques, that I already know work, to Twitter and my blog. Converting them to sales wasn't as simple. But it's definitely doable. I want to show you what I did that got me free targeted traffic and more sales from these few tweaks that I made (it has nothing to do with "mass following" or anything like that). I put everything I did into a series of videos. They're full of meat, and they show you exactly how you can do the same thing I did to get results like this. If you're just looking to gain more followers on Twitter, you'll get that here, but you won't be pleased with the results. 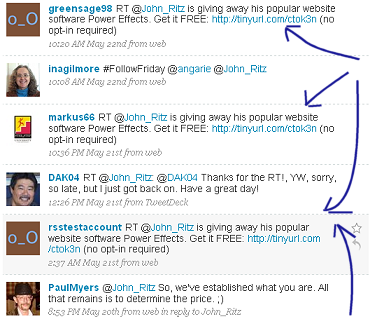 I'll wager you'll do a LOT better with the targeted traffic and SALES that these followers will bring you. But you need to know how to get the right people to follow you. These videos show the EXACT steps I've done in the last 3 weeks to get massive targeted traffic to my blog, and more importantly, sales! Claim Your Set Of Videos Now! In fact, look at my blog traffic analytics. Every time there was a spike in traffic and sales, it coincided with a promo or tweet I did on Twitter. There's no coincidence there. This stuff works, and it's not that hard to do. UPDATE: In the week following my "experiment," I noticed that my targeted followers continue to climb (leading to even more traffic and sales). What did I do? Absolutely NOTHING! That graph shows the week after my 3-week test. 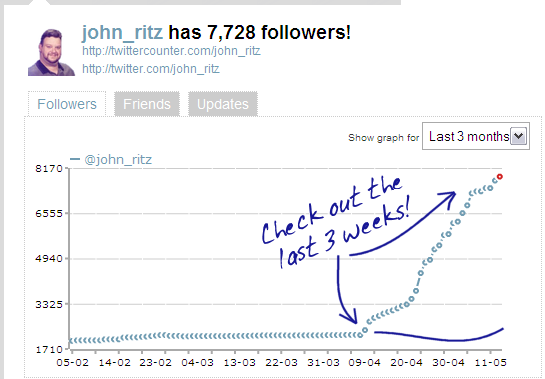 Notice my qualified followers continued to rise, even when I did nothing. I barely even tweeted that week (and certainly didn't do any promos), because I was pulled away, working on other projects. So this thing is like a runaway train. Once it gets going, it continues to gain speed with or without you, once you plant the seeds. That's the viral element taking over. Your followers will keep things going for you, even when you're not there! My video series shows you step-by-step what I did, and more importantly, what YOU can do yourself to generate this kind of targeted traffic that leads to sales. Look at it this way: Twitter may be fairly new on the scene, but it's here to stay. With big companies like Zappos, JetBlue, Southwest, Comcast, Dell, MSNBC, Dunkin' Donuts, and countless others joining Twitter every day and building their own targeted followers, Twitter's not going anywhere any time soon. See, it's the late adopters who are going to find themselves trying to play "catch-up." Don't let your business fall behind your competitors'. They're already exploring new and creative ways to integrate their businesses with Twitter. 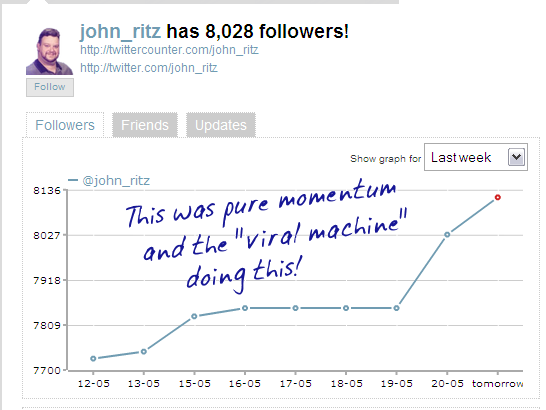 follower lists is the key to the "viral machine"
Get Your Tweets To Go Viral Like This Too! Doesn't it make sense to not only find out what all the fuss is about, but learn some of the cutting edge strategies being used with Twitter while the platform is still in its infancy? That way your competitors are the ones struggling to catch up to you! Now these videos are by no means an A to Z reference of everything you can do with Twitter. Such a thing doesn't exist. New innovative solutions are being created out of thin air all the time. But when you do invest in this video package, I'll make sure I keep you abreast of all the neat useful tips, tricks, news, software, and strategies that I come across as they become available. That way you're investing now and for the future! In fact, I'm not going to beat around the bush trying to convince you the value of these videos. I'm going to GIVE you one of my best ones—the foundation of viral followers right here—in the hopes that you see what I'm getting at when I talk about turning one targeted follower into a viral stream of many. I hope you see the power of this potential. Even MLM can't match this for sheer numbers reached with their "pyramid" structure. After all, there's absolutely NO pyramid of any kind here! No, this is MUCH more powerful. There's plenty more that I want to show you. I will admit, however, that it will take an hour or two to set everything up, then 10 minutes or so each day, depending on how much you want to gain using these methods. "More Than Half A Million Dollars In Sales!" "My first IM event was JV Alert Live in June, 2007 (I was greener than an unripe tomato at that time). "One of the people I met was John Ritz. "You have to remember that I was GREEN... I was not a copywriter, and I had NO products of my own. "John was fairly bigtime... a well-established copywriter with millions of dollars in sales under his belt. "John's advice helped me get my start as a copywriter. "I don't know if I've shared this bit of info with him before... but I actually did more than half a million dollars in sales for my copywriting clients over the following year." But like you saw above, once you set things in motion, you'll continue to see results whether you're at your computer (or iPhone or whatever you use to access Twitter) or not. How much for the videos? Well, given the potential these methods can have to your bottom line, I could easily charge $197 or more, and I'd still be providing MUCH more value than that kind of investment. After all, just ONE or TWO additional sales can easily cover the cost—and then some, depending on your own offers and price points. Even $97 would be a steal for everything you're getting here. Especially when you put all these tactics and strategies in place and see the difference even the tiniest (but well-placed) changes can make. Small hinges do swing large doors. 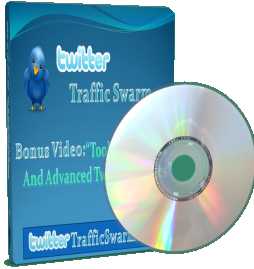 In fact, I know of several Twitter "courses" that cost $97 or more, and many of them barely scratch the surface of even the simplest methods I show you in this video collection. Ideally I'd like to give them away as dirt cheap as possible, but I've often noticed that people who pay little expect little value in return, and they stick the videos on a shelf somewhere or on their computer, never to be watched, let alone acted upon. I definitely don't want that to happen here. I want you to USE these videos to succeed. So after careful consideration, I've decided that $67 is a more-than-fair investment. But as part of this pre-release promotion, I'm letting them go for a LOT less, but only for the next few days until the "official" launch is underway (where I'll be adding even more resources, which you'll get as well). So right now—today—you can grab the videos and invest just $27. However, as I mentioned, this price is temporary. It's an introductory price, and it'll go up by AT LEAST $20 after the holiday when the launch gets going. Grab Your Copy At This Low Investment Today! And it gets even better, because if you can't use these videos, you don't pay! Get these videos in your arsenal now. Try out these techniques on your own. Use them in your own marketing campaign for a full 60 days. That means there's no rush... try it out at your leisure. If during that time these techniques don't bring you targeted traffic, and more importantly SALES, then I'll cheerfully give you a full refund with no hard feelings. And everything I sent you is yours to keep. I can make this guarantee because I'm confident in the quality of these strategies—and I know that once you've put them to the test in your own campaigns, they'll work for you too. Look, I put these steps into place in just 3 weeks, and that's with me figuring things out along the way. You've got a full 60 days to try them out. Here, I'm showing you what I did, so 60 days is like an eternity for Twitter. Give it a try for yourself. If you're not pleased in any way, just let me know, I'll refund your money, and we can still part as friends. Absolutely. In fact, there's a LOT more. You see, Twitter is constantly changing, and it's a challenge just to keep up with all the new cool apps and resources that are popping up every day. So I've created a way for you to get all the good stuff that I find, that I'm always on the lookout for. That means you'll always be getting new stuff as it becomes available, without paying a monthly membership dime! Some rather devious ways to get your tweets to stand out from everyone else's—so they notice YOUR message, and more importantly, ACT on it! Cool new Twitter apps that are appearing all the time—like the one that'll automatically send a tweet to your computer or mobile phone whenever your website goes down! That's enough to make this offer a no-brainer. But I've got one more trick up my sleeve! I'm also going to give you a resource guide that offers even more tips and expands on some of the topics and strategies I discuss in the video series! And—you still get everything for this ridiculously low investment of $27! Right now Twitter is relatively spam-free. People feel "safe" there. They don't have their guard up—yet. How long that will last is anybody's guess, but I'll go out on a limb and say it won't last long. That means the window of opportunity for you is NOW. It's going to become much harder to achieve these same results very soon. I want you to take advantage of this situation before it's too late, and people tune out anything that even remotely smells like there's marketing involved. You know, right now the average person is exposed to about 3,000 advertising messages a day, according to Michael Brower, PhD, and Warren Leon, PhD, in their article Practical Advice from the Union of Concerned Scientists. Even estimates on the low end put the number at closer to 1,000. But my point is this: How many of those thousand ads do YOU recall? I'll wager maybe only a handful, if that. "Imagine Twitter as a brand-controlled resource..."
As you read this, Madison Avenue is frantically trying to figure out how to penetrate the Twitter market, with its growing user base and influence. It's inevitable that Twitter will become an advertising haven at some point. Just imagine how hard it'll be to get your message heard then? The good news is that my 3-week experiment proves that it is possible to build a targeted loyal following of like-minded people in your niche who would love to learn more about what you have to offer, before the spammers and endless ads gain a foothold. And those followers will back up their loyalty to you with their wallets. Remember, my results were based on me learning the ropes along the way. Here I spell it all out for you, exactly what I did, the tools I used, the methods, and the results I obtained. Armed with that knowledge, you may be able to do even better than I did with the limited time we have left before Twitter becomes a spam-infested playground. So grab your copy today and start bringing in targeted traffic to your blog or website, while the fruit is still hanging low. Let me tell you, it's a beautiful thing when those sales start coming in! YES, John! 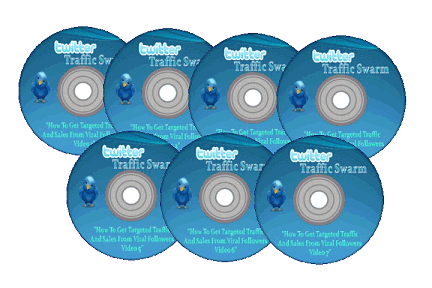 I want targeted traffic to my blog or website, and I need more than Twitter followers, I need actual sales! I want to see what you've been able to accomplish in your video series, and I'm looking forward to putting these same tactics to work for my own campaigns, while the opportunity is still ripe! I understand that you make NO promises or guarantees that I will produce any specific income or result. I realize that my market, my own efforts, and my business are all unique, and my results may vary from those shown or implied. However, I also know that if I don't get the results I want, or for any reason whatsoever within the first 60 days, I can ask for a complete refund, and you will cheerfully refund my entire purchase price. Either way, I can't lose! P.S. 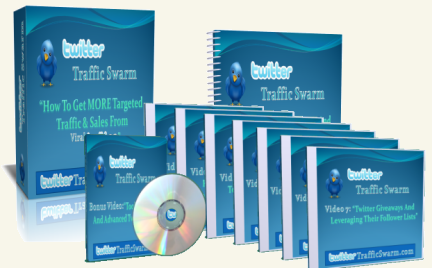 With a 60-day guarantee, this is the best way to ensure you beat the Twitter rush and don't get left behind. I'm almost embarrassed to offer a full two-month guarantee when it comes to Twitter. This stuff changes quickly. After all, look at what happened to Facebook, never mind MySpace!